Seth MacFarlane's sense of humour might not be classy, but the gears behind it work well enough to turn what could have been a wildly unnecessary sequel into a solid two hours. The first Ted film was a hilarious, if uneven, take on the buddy comedy, sparking life into a sub-genre that seemed to be falling out of touch. It succeeded in making us laugh, but it couldn't really do much beyond that. The story wasn't interesting, there was no depth there. But that was OK, MacFarlane appreciated this and didn't attempt to fill his feature length debut with wasted narrative heft and emotional weight. Ted 2, however, acts as that stereotypical sequel that needs to try and take things up a notch or two in order for it to stand apart from its predecessor. So here MacFarlane has attempted some pretty big themes and crafted a story that, if told correctly, could prove to be quite interesting. The issue is that it just isn't told correctly and so, much like the first one, Ted 2's only real triumph is in its humour. After Ted marries his girlfriend Tami-Lynn, their relationship becomes rocky, and so they decide to have a baby. Except Ted, being a stuffed bear and all, cannot produce children, so they visit sperm donors only to find out that Tami-Lynn's drug history has rendered her infertile. As background checks are carried out, Ted discovers that the state authorities of Massachusetts do not believe him to be human and declare him as "property", resulting in the loss of his job and his marriage to Tami-Lynn annulled. It's a considerable amount of plot to get through, and this all only occupies about fifteen minutes of the film. It's almost as if MacFarlane couldn't quite decide which humans rights issue he wanted the film to focus on, and so just threw in as many as he could find to fill it up. By the time the plot starts moving forward, it shifts focus so many times and just abandons so many threads at the drop of a hat that what would have been a simple story starts to feel convoluted. For example, around the mid point of the film, Ted 2 shifts from being a court room comedy to a road trip with no real warning, and it gives the film an uneven tone throughout. Once Ted, John and Sam (played wonderfully by Amanda Seyfried) hit the road, Tami-Lynn (a frequent on screen presence in the film's first half) seems to just disappear from the story entirely, there's no mention of her again until the film's final 10 minutes. Ted 2 bounces from weddings to libraries to court rooms to apartments to an abandoned shack in the woods to a marijuana patch to New York to a Comic-Con convention and then back to a court room again, but there's nothing holding it all together. What begins as an interesting narrative idea gives in to the jokes and a film that could have offered some smart, thought provoking themes and ideas (humanity, justice, civil rights) ultimately becomes messy. But Ted 2 doesn't exist to provoke our thoughts. 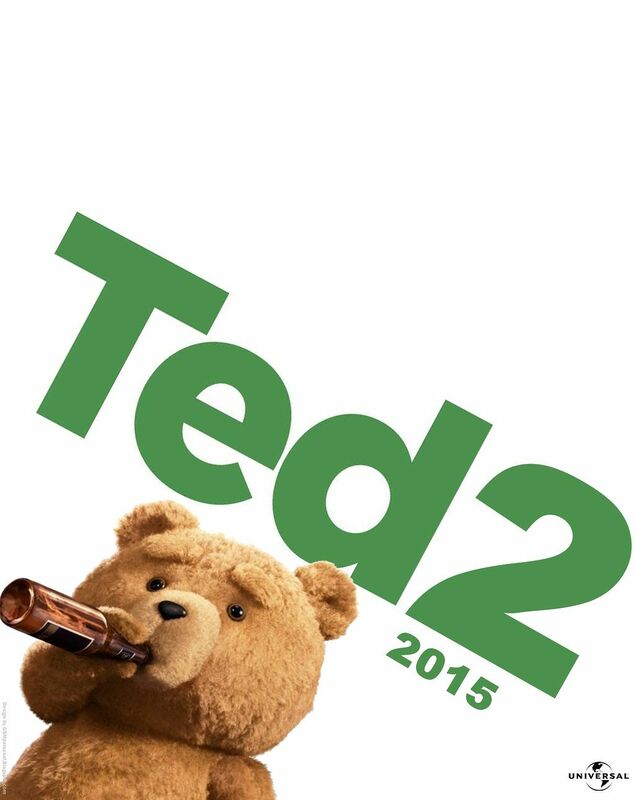 Heck, Ted 2 probably doesn't even exist to create a workable narrative. Ted 2 exists to make us laugh, and this is the most I've laughed at a film all year. It might not have as many hilarious moments as it's predecessor, but this is a consistently funny film that refuses to go two minutes without a joke. Ted 2's sense of humour is hardly sophisticated, but it does feel like a slight step up for MacFarlane; there are some really clever gags running through this film. The Jurassic Park inspired marijuana patch scene doesn't make a whole lot of sense but it's brilliantly funny, as is a random supermarket encounter with Liam Neeson in the film's opening act. In perhaps the film's funniest moment, after commenting on how nice the waiting room is in which they're sitting, John rests his feet on the glass table in front, only for it to shatter loudly under the weight of his shoes. It's funny enough as it is, but when Ted looks sorrowfully at the smashed glass on the floor around them and comments "And there is our first impression", the audience (myself included) laughed so loudly I missed the next few lines. Also, whilst the constant location shifts make the story difficult to grasp onto, it simultaneously keeps the humour and the character work fresh. Ted 2 doesn't offer much in terms of interesting character development, but with so many different set pieces, they each get more to do. The whole sequence by the marijuana field essentially stops the narrative dead, but it's loaded with some fantastic laughs, and the film even slows down long enough for Seyfried to sing an acoustic song about the moon while various animals approach to listen. When Seyfried sings, it does not surprise me that fish jump out of the water and lobsters appear on the grass just to listen. It's moments like this that, even if played for laughs, show a sense of maturity growing with MacFarlane's work. There is a moment towards the film's very end where it would have been extremely easy to dodge a nice character beat and fill it with a weak joke, but MacFarlane gives in this once, and creates a genuinely nice moment for two of his characters. It might not happen often, and he's certainly taking his time, but there is solid progress here, and it is truly refreshing to see. But, for those who appreciate MacFarlane's offensive, boundary-pushing humour, have no fears. Ted 2 might be step up from his previous work, but the film is still filled with jokes about black penises and a comedy improv session is butchered by John and Ted who shout out suggestions such as "9/11! ", "Ferguson!" and "Robin Williams!". It's fitting that Ted 2 feels slightly more mature than its predecessor, but it also leads the film into its biggest mistakes. By trying to be bigger and bolder, but without the determination to sustain it, MacFarlane's sequel becomes a film that never settles into the right groove for long enough, resulting in a tone and plot that veer wildly from beginning to end. It will be debatable as to whether Ted 2 is funnier than Ted, I would place them roughly on a par, with the original offering more uproarious laughs, but the sequel feeling more consistent. The humour works perfectly fine, and the performances are great (Seyfried in particular), but there are too many issues to label this a complete success. It's great fun, but Ted 2 takes on some surprisingly big themes, and it fails to do any of them justice. Ironically, one of those themes is justice. Hm. To Summarise: It might not scale the comedic heights of its predecessor, but Ted 2 is a constantly funny and suitably wacky sequel despite poor plotting and tonal imbalances.